I never wanted to be the mother who rushed her children from one activity to the next, cramming their little lives with an overwhelmingly big schedule. Yet somehow, with four children on different schedules, I feel like that mother. And I was reminded of it when my youngest son said to me “When does it end?” Thinking he was talking about the end of the school year I replied, “What? School?”. “No… everything….” he said. By everything, I’m pretty sure he meant swimming, gymnastics, athletics, golf, guitar, dancing and lacrosse. See? I am that mother. Author Jane Godwin and illustrator Anna Walker make a successful team. We have reviewed two of their books previously – the delightful All Through the Year and the sweet story of Little Cat and the Big Red Bus. 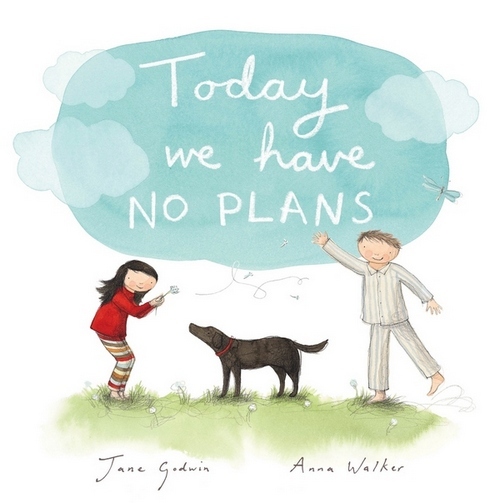 Their latest release, Today We Have No Plans, is highly relevant for many families. It follows an ordinary week in the lives of a little girl and boy beginning with the rush of Monday morning to swimming on Tuesday, after-school care on Wednesday, music on Thursday, shopping on Friday and sports on Saturday. And so follows a lovely description of pyjama days, building cubbies, baking cakes, playing in the backyard, doing craft and basically taking the time to slow down. I have mentioned my admiration of Walker’s heartfelt, gentle illustrations previously but I think this book is now my favourite – the illustration of the swimming pool from above is genius – for something that is essentially static, the picture conveys motion, fluidity and ‘business’. Likewise, on Friday while grocery shopping, the mother has a scowl on her face and looks completely worn out. These are situations that everyone can relate to and the message of the book has broad relevance, no matter how many extra-curricular activities are on your schedule. Today We Have No Plans is suitable for children aged four and over. Find it online at Fishpond. For another good book on taking time out, see our previous review on Take the Time.